Time now to attack the East Coast. This side of Tassie is more cultivated but still there are large areas of mountains and bush. There is generally easy access to the coast. Our first camp is at Coles Bay. This bay sits to the western side of some granite peaks the other side lies the Tasman Sea and Wineglass Bay claimed to be the most perfect bay in the world The only access to the bay is by boat or over the granite peaks. This involved walking or was that climbing over the peaks. Well not quite the peaks but the lower bit in between them. All in all a bit energetic for two senior cits on holidays. So for us Wineglass Bay remains elusive. While at Coles Bay we were within striking distance of the Historic town of Ross in the Midlands. This was a great drive through pastoral land, Bush and then cultivated land. Ross is on the main highway from Hobart in the south to Launceston in the north. This was a convict location with many of the early building still in use today. Ross is very popular with the classic car clubs and bike clubs meeting from north and south. 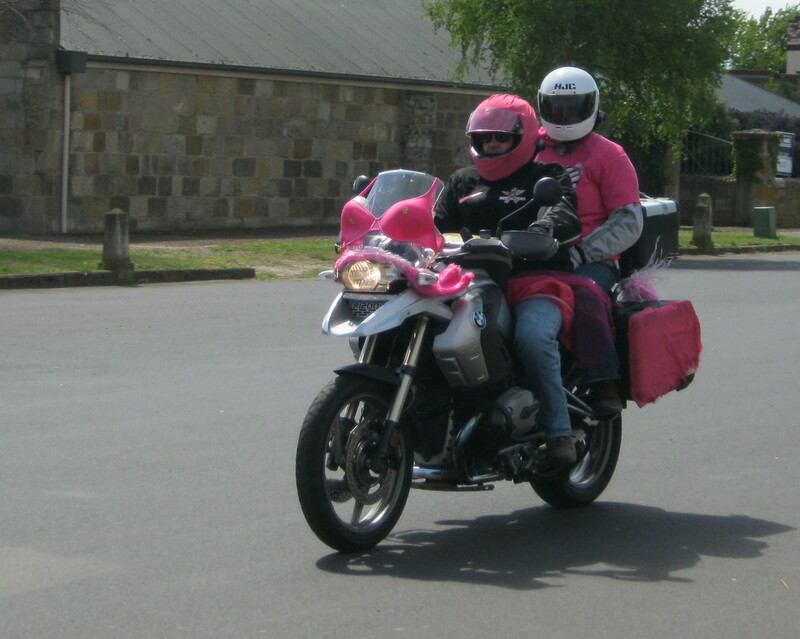 While we were there a large group of Ulysses bike club members arrived for morning tea and to make sure they were displaying anything pink. They were to meet up with the northern clubs in Campbell town 15 kilometres up the road for a picnic and fundraising day. Ross also had a craft market day so we were able to check out the produce of the local crafters. Onward to Campbell Town and the troops were gathering for a big day. Then we headed for the coast again, this takes you through Fingal and St. Marys. Fingal appeared to be a sizable village and we weren’t sure why, but on the way out we came across a coal mine, mystery solved. St. Marys is at the edge of the Break of Day Plains which is a highland plateau from which you have to descend to the coast either by St. Marys Pass or by Elephant Pass. We chose Elephant Pass as you start your descent you have to stop at the Elephant Pass Pancake Café. Yumm chicken camembert and blueberry pancake plus many more exotic combinations. Lunch over and down the pass we go on to the coast road. We make it back to camp in time to watch the Australian MotoGP. What a shemozzle that race was with rider having a compulsory pit stop and riders black flagged. Back on the mainland we headed for Port Arthur. This is the site of a Penal colony built around 1830 to reform repeat offenders, make them part of a machine that would show them the light. The site contains over thirty historic buildings. We booked into the Port Arthur Holiday Park which is situated on Stewart Bay and amongst the bush. There is a multitude of wild life that frequent the park as evidenced by their calling cards. 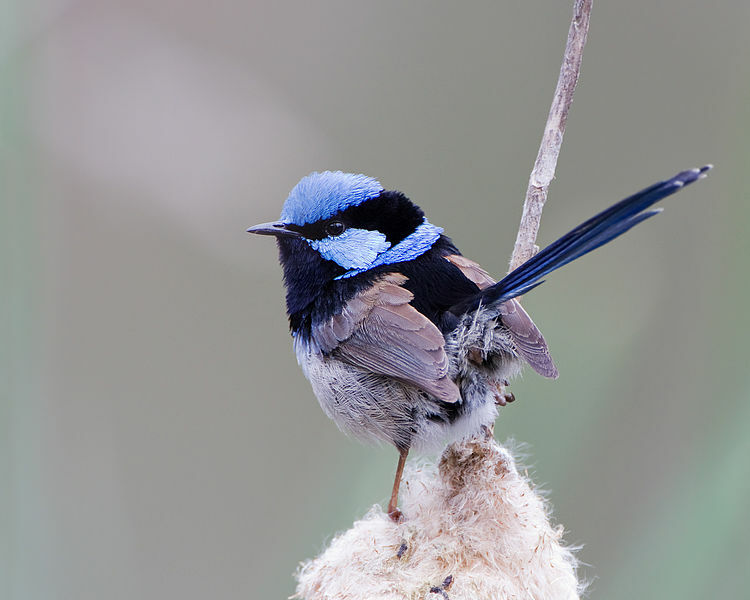 The bird life is abundant but the ones that made themselves known most was the Superb Fairy Wren. This is a small wren where the male has beautiful blue markings and the female, as in most birds, a rather dowdy brown. These birds love to look at themselves and the favourite spot is in the car’s rear vision mirrors or they attack there reflection. This great excitement causes them to defecate (poop) every where. Thus each morning involved de-poopping the car before the days travels. They were cute. We were most impressed with the way Port Arthur site is run. Your entry gives you access to a walking guided tour and harbour cruise. The entry pass also gives you two days access to the site and if you pay an extra $6.00 they give you a “Ticket of Leave” which will give you access to the site for 2 years. The guided tour gives you a quick history of the site and what it was designed to achieve. There are several places on the site where you can eat and are very reasonably priced. It is possible to spend quite a bit of time here as there are museums and displays. There is also access to the database of all the convicts that went through Port Arthur. 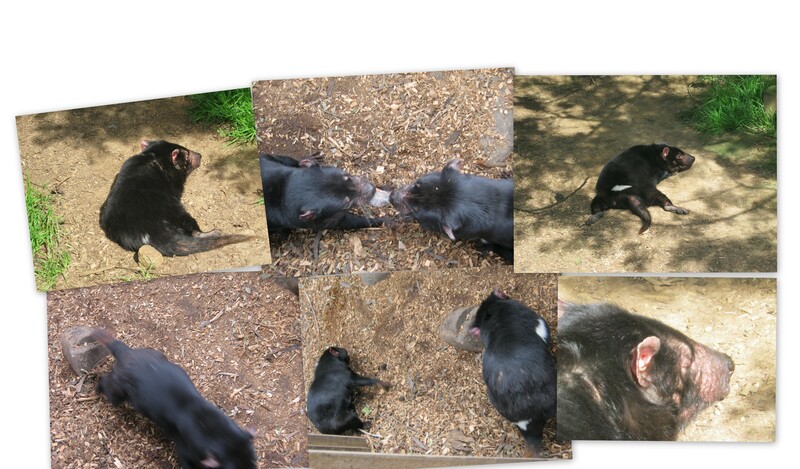 After Port Arthur we went to the Tasmanian Devil Conservation Park. 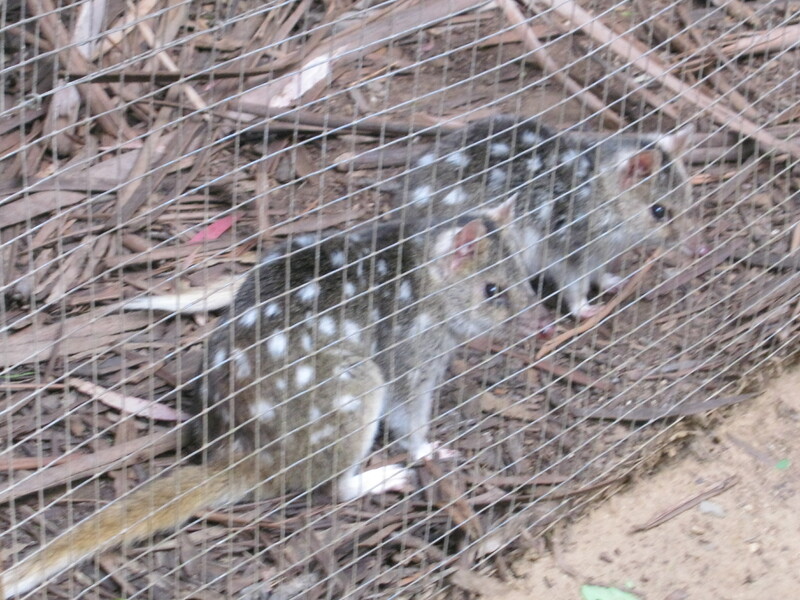 There they had displays of devils, quolls, wallabies and birds of prey. Feeding of the Devils is a frenzied affair as the Devils fight for the food. They feed them rats and they will devour them completely including bones and fur. They are reputed to have the most powerful jaws of any mammal. 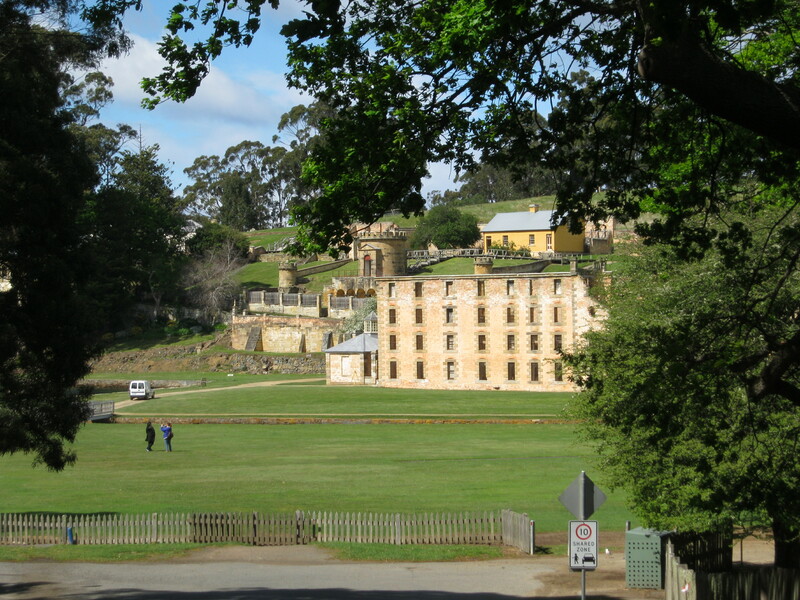 The next day we toured the rest on the Tasman Peninsular on which Port Arthur is situated. This started at Eaglehawk Neck. This it a narrow strip of land that joins the peninsular to the mainland. This is only about 50 metres wide and about 500 metres long. 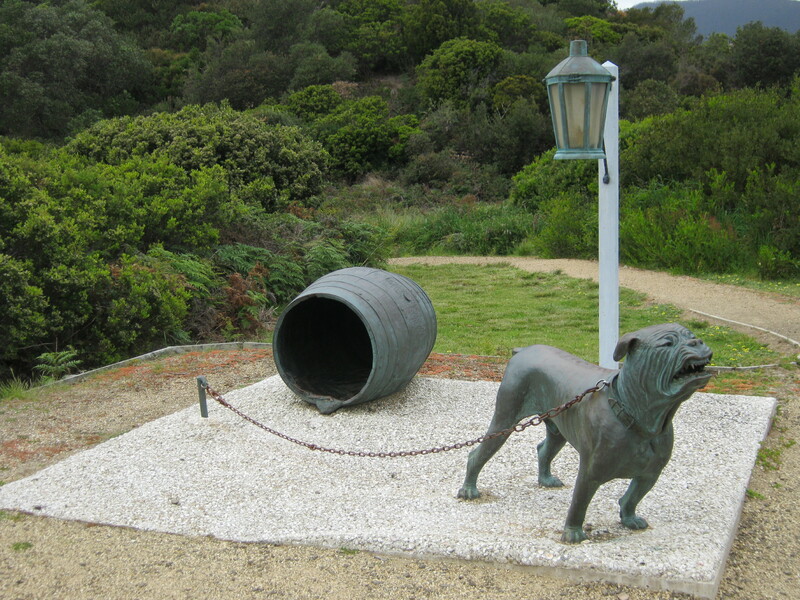 At the narrowest point the Warders of the penal colony set up a line of dogs chained just far enough apart not the eat each other but able to share a food bowl. This line was to stop escapees from crossing the line to “freedom” but mainly to warn the guards of prisoners approaching. Swimming was not an option for most prisoners as they hadn’t developed “Aus-swim” in those days plus the water was bloody cold. We left Queenstown after it refused to stop raining although it did seem like a lovely town. I got a discount at the local hardware store when I purchased a two way spirit level. I think he was just pleased to have a customer. 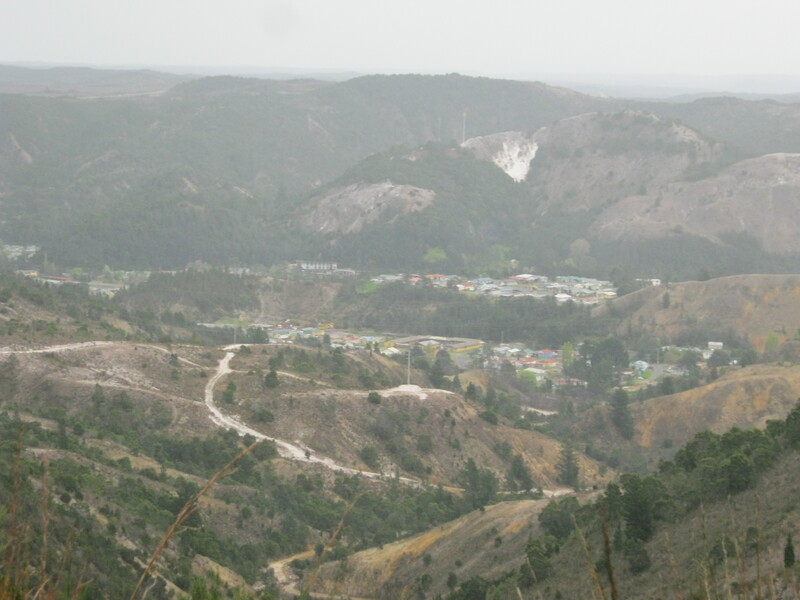 The drive out of Queenstown is a steep winding road with a lookout almost at the top, luckily we went up without the caravan the day before to take in the view in the rain. The road is quite windy through the mountains but there are some spectacular sights. We stopped at Derwent Bridge Heritage Pub for a coffee, unfortunately his espresso machine had broken the day before (likely store) so it was dripolator coffee with frothy milk. Should have had a beer but it wasn’t midday yet. We continued on down the Derwent Valley and stopped in Hamilton at the Cluny Farm Café where I introduced Pam to a Tasmanian delicacy the scallop pie. The scallop pie is what it says, Tasmanian scallops in a white sauce inside a pie crust. After dinning in style we continued on to Hobart over the Tasman Bridge onto the airport were we stayed in a new caravan park with our own ensuite. The park was attached to the Airport Travelodge and been designed from the ground up. It is a level site but I hoped they sacked the designer. Entry is via a boom gate which is situated before you get to reception so the boom gate has to left open during the day. The caravan sites are at an angle to the driveways, great idea allows you to back in easily, oh no you can’t because he put the parking bays for the cabins on the other side of the driveway so if a car is parked there it is almost impossible to back your van in. We got had an ensuite which is situated to the rear of the van and to the opposite side to your van entry, then you run all your services to the back of the van to connect them, straight across the pathway to the ensuite. The “Ensuite” was a wet room. You enter through the door as it swings past the toilet bowl missing the front edge by half an inch, the hand basin is now behind the door but that’s OK you just close the door. In the diagonally opposite corner is a shower with no screens or curtains just pushed into the corner, the floor is level except for a slight indentation around the shower drain. The mixer tap has a long handle as you see in hospitals, which is great till you back into it while showering and suddenly the shower goes cold. I mentioned the ensuite to the receptionist who said that this was a disability ensuite. Oh I said so you either trip them up with the services getting to the ensuite or run over them with a wheelchair, then you maneuver them into the ensuite past the toilet. Then you shower or toilet them without the aid of rails, make sure the floor is saturated and then get them out without knocking the toilet over and triping them up on the services back into you van. I’m glad I’m not disabled only getting old and grumpy. All in all they were new and clean and they did give you a mop to mop the floor. Hobart was punctuated by more rain but sometimes it didn’t rain but most of the time the wind blew and blew. Most nights we were gently rocked to sleep as the van rocked and rolled in the wind. I think by now you must be getting the impression that Hobart isn’t very nice, well it is well worth a visit and the city is over shadowed by Mount Wellington (1,271 metres). Mount Wellington is often shrouded in cloud but on Saturday we noticed it was clear at the top. We set off for the summit but half way to the top the cloud came across and soon the rain came. On reaching the summit the rain was horizontal and according to the current weather observations the temperature was 5 degrees with an apparent temperature of -12 degrees so we didn’t venture out of the car. We got off the mountain without incident and attempted to find a coffee south of the city. Not a lot of luck but we did get to look around Battery Point. Eventually we headed back towards the city and saw a coffee shop but it was closed but as we looked towards the water an outdoor restaurant appeared through the drizzle so we parked the car donned our wet weathers and headed for the café only to find it was a pizza shop but it did have an espresso machine. The trip down was taken gingerly. 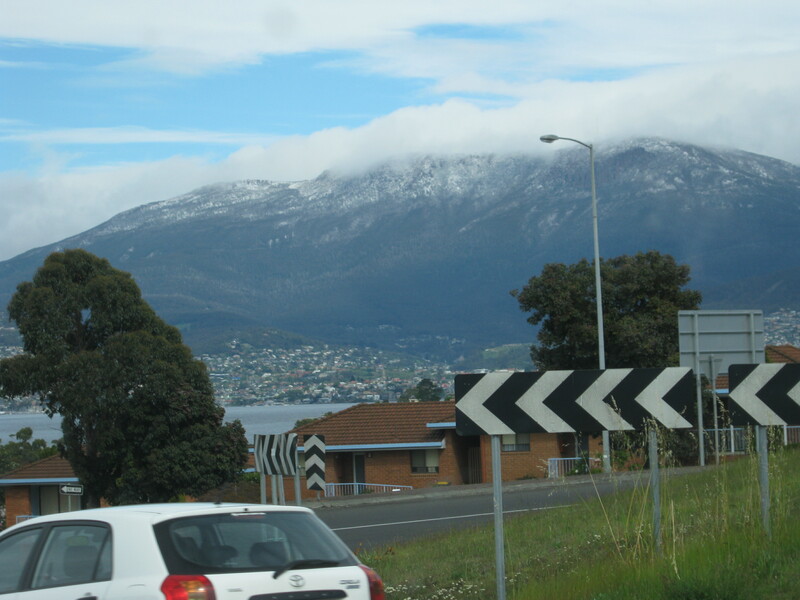 The next day as we were leaving Hobart, Mount Wellington was bathed in sunlight and covered in snow. Driving around Hobart brought to light several other quirks of Tasmanians. They can’t merge in traffic; they have merging lanes but stop and wait for a break in the traffic. On the approach to the Tasman Bridge they have 5 lanes that merge into 2 or 3 lanes depending on the lanes on the bridge. The left lane is allowed onto the bridge unhindered but the other 4 lanes are controlled by traffic lights so that 2 lanes are stopped while the other 2 continue onto the bridge then they stop them and let the other 2 lanes have a go. This works well most to the day until a ship wants to go under the bridge. The bridge is an arched bridge designed to allow ships to pass freely under it but back in 1975 a bulk ore carrier bumped in to one of the pylons knocking out a section of the bridge so now when a ship wants to pass under the bridge they stop all the traffic from flowing over the bridge while the ship passes beneath once past the traffic is allowed to continue. 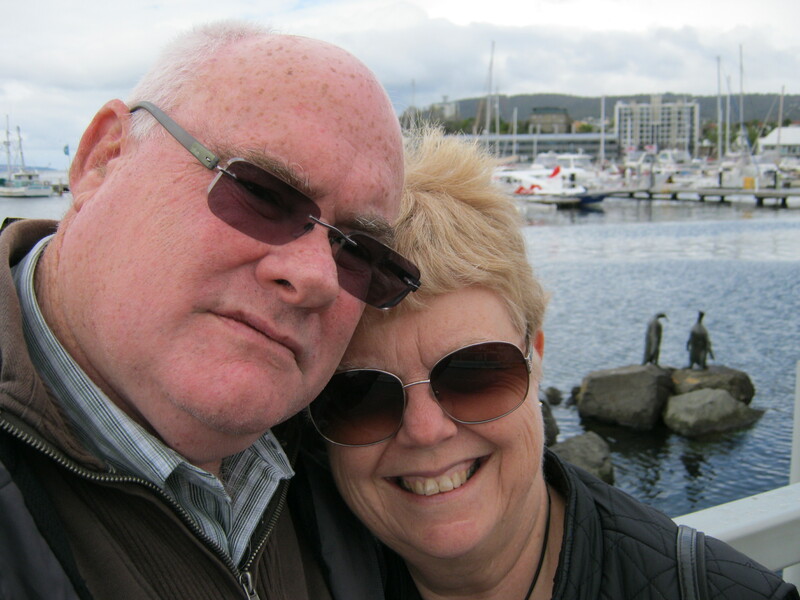 After Hobart we headed south to Kettering to catch to ferry to Bruny. We arrived in time to catch the ferry and the 15 minute crossing to North Bruny Island then drove to South Bruny Island. The islands are connected by an isthmus referred to as the “Neck”. 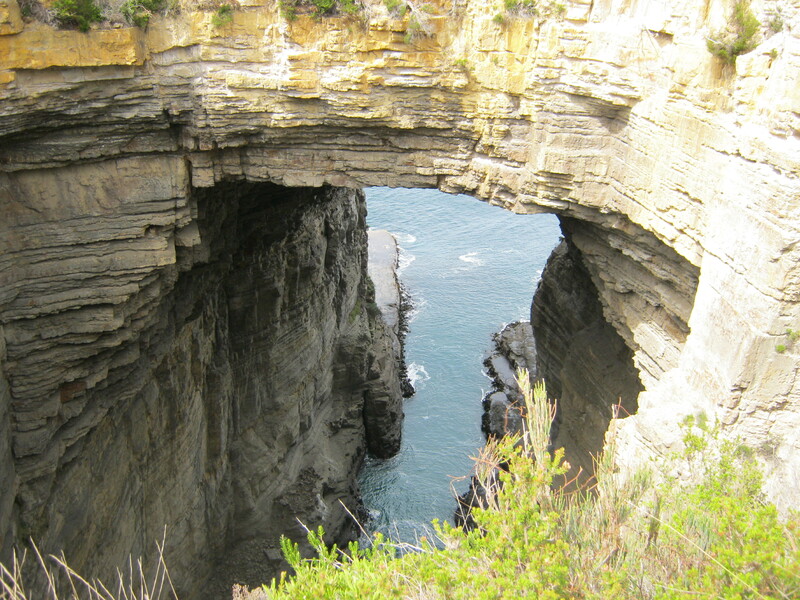 I had read several novels on based on Bruny and at an image of driving across the Neck with the sea visible on both sides but it is a little more substantial than that but in places probably only 50 metres wide. My second cousin John lives at Adventure Bay on South Bruny so we pulled the van on to his block for several nights. John showed us the sights of the island including the lighthouse at Cape Bruny. We dined one evening at the Bruny Island pub and on the drive home through the bush we came across lots of possums and wallabies. Unfortunately we didn’t see any white wallabies that are found on the island. We did however see a quoll have his supper on the side of the road.